by Joseph A. Sprince – Photography by Gerald B. Allen, except as noted. 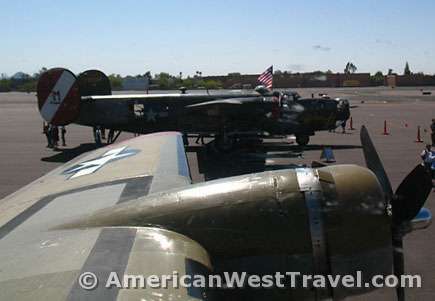 This past spring the Wings of Freedom Tour flew into Arizona, and Gerry and I caught up with it at the Scottsdale Airport. The popular tour features three of the most famous combat aircraft from World War II, all of them flyable. They include the heavyweight workhorses of the strategic bombing campaign over Europe, the B-17 (model G) Flying Fortress, the B-24 (model J) Liberator, and perhaps the most famous and successful fighter plane of all time, the P-51 (model C) Mustang, in a unique 2-seat configuration. 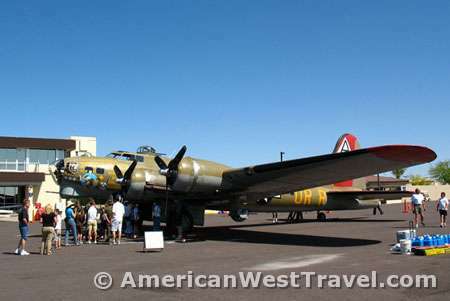 [Photo, left] A B-17 Flying Fortress, perhaps the most famous and romantic airplane of World War II. The heavy bomber was the mainstay of the strategic bombing campaign over Europe from 1942-1945. The plane had a reputation for sustaining great damage on its missions and still making it back to base. Yet more than one third of those built were destroyed in combat… That’s me in the green cap. My parents are right behind me. My father who is 90 years old is wearing his VFW cap for his World War II service in the 20th Air Force. He was part of the ground team servicing B-29 Super Fortresses on the island of Tinian in the Pacific. I think he was proud to attend this show, and I was proud to bring him along. 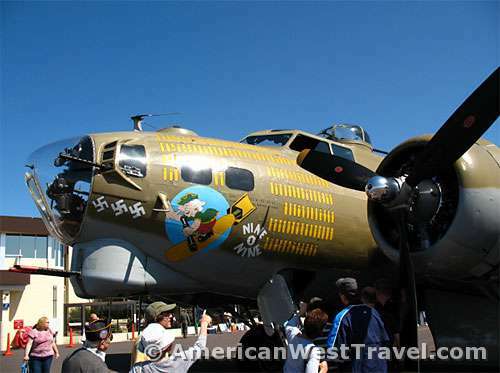 The planes were available for viewing on the ground which included a tour through the inside of both B-17 Flying Fortress and B-24 Liberator. Half-hour flights were available on either bomber but it is an expensive ticket. The more affluent flier might consider an hour of “Flight Training” aboard the 2-seat Mustang, surely a once in a lifetime experience. A flight on any of these planes is a very rare privilege because there are only a handful of them left in flying condition. The costly tickets are considered donations toward the upkeep of these vintage aircraft. Maintenance is extremely expensive. Many of their parts must be custom fabricated. 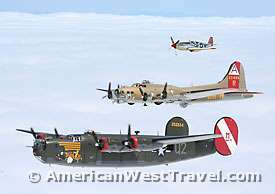 [Photo, right] The B-24 Liberator was the other heavy bomber used in the European theater. Its characteristics such as crew size, range, number of guns, bomb capacity, etc. were very similar to the B-17. Yet the B-24 did not share the same popularity or reputation. The B-17 was said to be more durable and handle better, and its total dropped bomb tonnage for the war was far greater than the Liberator. Ironically, far more B-24s were manufactured, 50% more, for the simple reason that they were cheaper and easier to make. [Photo, left] Inside the cockpit of the B-24J Liberator, apparently one of only two flyable B-24s left in the world. 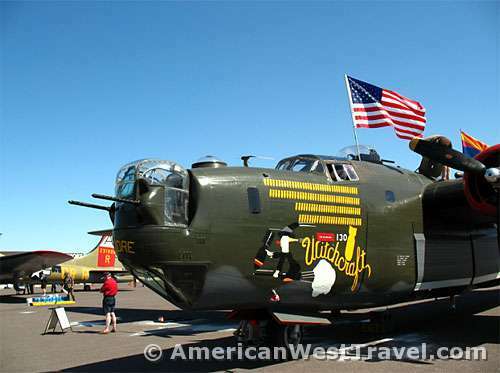 The other is a B-24A owned by the Commemorative Air Force (formerly Confederate Air Force). Model “A” represents the first version; model “J” the final version. It was surprisingly cramped inside the cockpit, as were most of the forward spaces inside the B-24. Here I sit sideways because I couldn’t squeeze my long legs in front of me. 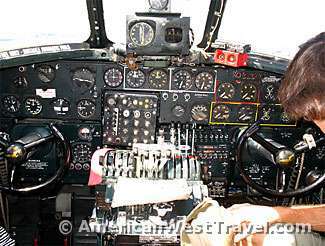 Having a small physical stature would be a definite advantage for working in a B-17 or B-24. Also, surprising was the limited visibility out of the narrow windows. The cockpit is set well back on the plane’s nose which also inhibits visibility. 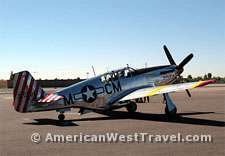 [Photo, right] This P-51C Mustang is the world’s only remaining dual control model. A small number of P-51Cs were converted to 2-seat primarily to provide VIPs with fast transport. The most famous passenger of a 2-seat Mustang was General Eisenhower who surveyed the battle scene at Normandy in the plane. The Collings Foundation of Stow, Massachusetts, has conducted the Wings of Freedom Tour since 1989. The foundation is a nonprofit educational organization whose purpose is to organize and support “living history” events that enable Americans to learn more about their heritage through direct participation. Their tour stops all over the country and attracts three to four million people each year. You may also book “flight reservations” online. [Photo, left] the Wings of Freedom in Flight, courtesy of The Collings Foundation Media. The planes and their crews flew during our country’s last undisputed war of survival; they were literally fighting for our freedom. Once perfected, the air fleets of the heavy bombers were truly “weapons of mass destruction.” Their business was carnage and destruction on a scale previously unknown in warfare. The destructiveness of air raids and the war in general should never be forgotten. Most of all, the airmen of the strategic bombers paid a terrible price in terrifying conditions. 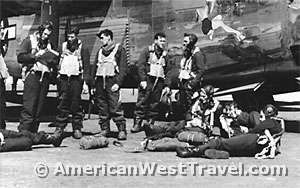 Their casualty rate was among the highest of any U.S. military organization during World War II. [Photo, above left] the B-24J Liberator, [Photo, above right] The B-17G Flying Fortress. 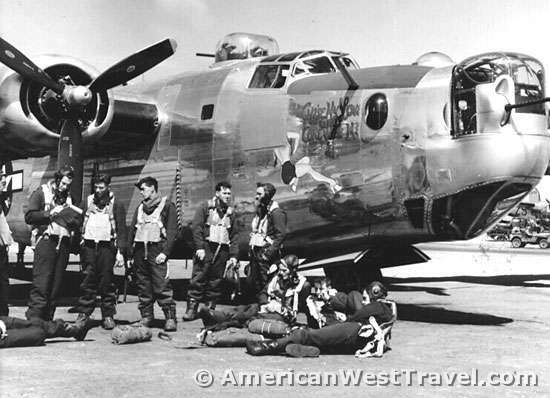 [Photo, right] The ten-man crew of a B-24 decked out with all their gear awaiting the start of a mission. There were four officers to a crew: pilot, co-pilot, bombardier, and navigator. The bombardier and navigator also manned guns when not performing their other duties. The six enlisted men manned the other guns with two of them also performing as radio operator and flight engineer. Photo courtesy of Remington Society. The bombers were unheated and unpressurized. During the winter temperatures could reach fifty degrees below zero, as the planes often cruised at an elevation of 20,000 feet or more. The crewmen were dependent on oxygen at that elevation, and the masks were unpleasant, clammy and could become frozen in the sub-zero conditions. There was no bathroom on the plane, and flights could be as long as ten hours or more.